Extravagant Night is one of two polish shades offered in Estee Lauder's Holiday Extravagant 2010 cosmetics collection. Every now and again EL comes out with a shade that catches my eye, and this is one of them. This charcoal based plum shimmer shade is filled with irregular multi colored glitter shapes and while it applied nicely, I did need to use 3 coats. Above & Below: This is an interesting shade that appears very much a plum shade in some lighting, but then picks up a touch of brown in other lighting. I picked this up at Macy's for $18.00 and while I'm not madly in love with it, I do think it's a very pretty shade. I was a little concerned with how streaky it was on the first coat, but it does become fairly opaque after the second coat. Their were some very minor 'bald' spots on the tips, so I opted to use a third coat. The color change from plum to a more brown shade brown is a nice little added bonus. That is a very pretty shade. I'm not in love, but it's very class with a fun twist, if that makes sense. That is a pretty polish. Love that glitter. I like that it's plum and then looks brown, gorgeous! gorgeous! this reminds me of China Glaze's Bogie....do you think they're similar? Usually Lauder doesn't blow me away but this one is really pretty! you've been tagged for a blog award! Hello Mary,it's been too long since I've dropped by to say hello. I've been wondering about this polish. From the pictures that I've seen,it reminds of one of Opi's Christmas polishes from last year. Can't think of the name at the moment. I did buy Estee Lauder's Extravagant Gold eye palette,and the lipstick in Extravagant Red. I'm in love with these items at the moment. I don't usually wear red lipticks,but this one is very wearable. Plus...I think I must be getting in the Christmas spirit too...lol! Thanks for your thoughts on this polish. I will take them into consideration,before purchasing this polish...since I really don't need another polish...lol..but it is very pretty looking. ~Spaceinvaders~glad you like it! Once I had it on, I liked it rather well myself. I was just a little concerned after the first coat, but it did build up nicely. ~Aurora's Nails~that's pretty much my feeling on it. I'm not crazy about it, but I do like it. ~Martje~it's pretty, no doubt. I really like it's purple/brown action! ~Stavroula~I like the color-changing of this one too. Makes it a little more interesting. ~Jette Fromm~yes it would! I'm thinking about wearing this one for Thanksgiving for sure. ~rmcandlelight~glad you like it! 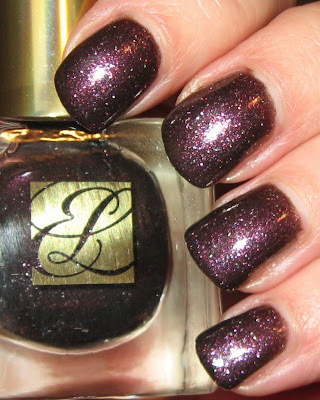 The other shade in the Holiday collection looked quite similar to other shades I have, but this was a bit different. ~Lucy~I do like the plum shade just the way it is, but I think the brown change is what makes me like it more than average. ~BlushingNoir~I totally agree, most of the time I'm not a huge fan of their shades. I do love the bottle design though and have picked several up over the years that have caught my eye, including this one. Thank you so much for the award! ~Annie~happy you like it! It's a nice shade for all of the upcoming Holidays. ~Velvet~Hello! Nice to see you on again :) I'll check out the OPI one--can't recall the name, but I know the one you're talking about. I'll do a comparison of that and the ChG that BlushingNoir asked about for you both. Both of the palettes looked really pretty, but I bought a few too many palettes during Sephora's F & F, so I passed on the EL ones. Glad you like yours!